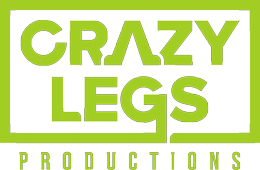 Crazy Legs Productions is always looking for crazy good ideas with mainstream appeal. If you’ve got an idea for our next hit show, begin by accepting the terms and providing the information requested below! By submitting any concepts, ideas, treatments, characters, sketches, plots, themes, dialogue, descriptions, scripts, demos, sizzle reels, audio/video, or other such materials (each individually and collectively, “Materials”), I understand and agree that the same are being submitted on the following terms and conditions, and that Crazy Legs Productions (CLP) will not accept or evaluate the Materials in the absence of this Agreement. No confidential or fiduciary relationship exists between CLP and me, and no such relationship is established by this Agreement or by submission of the Materials. I am the owner of all rights in the Materials or the duly authorized agent of the owner of all rights in the Materials, and I have full authority to submit the Materials. I understand that the Materials will not be returned to me and release CLP from all liability for loss of, or damage to, the Materials. This Agreement is binding on me and any entities for which I am acting. This is a non-commissioned submission. There was no request that the Materials be created or submitted. A separate agreement will be negotiated between CLP and me if the Materials are to be used. Notwithstanding the foregoing, the Materials may be used, without any obligation or payment to me, to the extent that such Materials (a) are similar to or contain elements of a concept already owned by CLP or in development at the time of submission, (b) are not unique and concrete as to be entitled to intellectual property protection under the law, (c) have been made public by anyone at the time of submission or are in the public domain, (d) would be freely usable by a third person if they had not been accepted as a submission or the subject of any agreement, (e) are not protected by Federal copyright law, or (f) are similar to other projects that are independently created by CLP or third parties. I am not entitled to any compensation because of CLP’s use of similar materials that may have (a) been independently created by CLP, or (b) come to CLP from an independent source, whether before or after the date of this Agreement. In any dispute arising from alleged use of the Materials, I must prove that the Materials were used (and that the alleged similar materials were not independently created). No inference of copying or use will arise by virtue of (a) any similarity between similar materials and the Materials, or (b) my submission of the Materials or CLP’s access to the Materials. Neither my submission of the Materials, nor CLP’s review (or use of) the Materials, constitutes an implied in fact or implied in law contract, even if there exists an industry custom or practice to the contrary. I will indemnify CLP against all third party claims or liabilities (including attorneys' fees) arising from any breach of any warranty given by me. I release CLP from all claims, demands and liabilities, known or unknown, which may arise in relation to the Materials, except for fraud or willful injury on CLP’s part. In the event of a breach or alleged breach (a) related to the Materials, or any part or idea therein, or the submission thereof, or (b) relating to this Agreement, my remedies will be limited to a remedy at law for damages. I will not be entitled to any form of equitable relief. Any dispute relating to this Agreement will be resolved by binding arbitration before a single arbitrator. All arbitration proceedings will be administered by JAMS in accordance with its streamlined arbitration rules and procedures or subsequent versions thereof, including its optional appeal procedure (the “JAMS Rules”). The arbitration will be conducted in metropolitan Atlanta, GA. This Agreement will be governed by and interpreted pursuant to the laws of the State of Georgia, excluding choice of law rules. This is the complete and binding agreement between the parties and supersedes all prior understandings, both oral and written, with respect to its subject matter. The invalidity of any provision of this Agreement will in no way affect the validity or enforceability of any of the remainder of this Agreement. This Agreement cannot be amended, except by a written agreement signed by both parties. This Agreement will inure to the benefit of the parties and their respective heirs, successors, representatives, assigns and licensees. I hereby state that I have read and understand this Agreement and that no oral representations of any kind have been made to me, and that this Agreement states our entire understanding with reference to the subject matter hereof. Any modification or waiver of any of the provisions of this Agreement must be in writing and signed by both of us. Do you agree? * Do you agree to all of these terms? Incomplete submissions will not be read.